Are you getting eLearning courses done without first figuring out a plan for achieving the outcome? If your answer is “yes,” this template is for you! Like in film and animation, storyboards encourage you to think about the content and design before developing the final product. They will help you see where the learning flows, or doesn't, and provide a concrete method to ensure you get to the outcome you desire. New to storyboarding and you don’t know how to start? Our free, customizable storyboard template will let you easily illustrate the scope and sequence of a project. 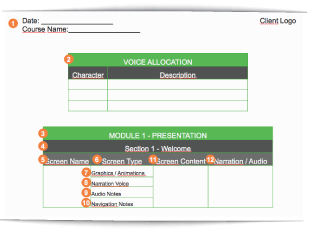 Have this resource at hand every time you need to create a new eLearning course!